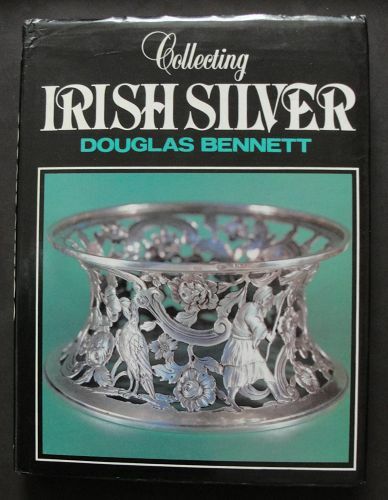 Offered is an important and useful reference work on Irish silver - "Collecting Irish Silver" by Douglas Bennett. This book used to be harder to find and is still a cornerstone reference work for antique dealers and collectors. It includes most of the maker's marks of 18th and 19th Century Irish silver - particular Irish provincial silver. This particular copy is in good condition, with normal wear from use but no major issues - clean and bright for the most part inside, and nicely preserved. All in all a fine addition to a serious reference library! This volume's specifics: 8vo 8" - 9" tall; 228 pages; 228p, 8 plates (in col) : ill. ; 24cm. Includes illus. of marks of goldsmiths and silversmiths of Dublin, Cork, Limerick, Belfast and Galway, and the hall-marks on Irish silver.